Home / Education / Global News / News / Dad Aged 63 and Son Aged 27 Graduate From The Same University Together! Dad Aged 63 and Son Aged 27 Graduate From The Same University Together! It was pride and joy all around as a 63-year-old dad and his 27-year-old son in New Jersey, US graduated from the same university together. 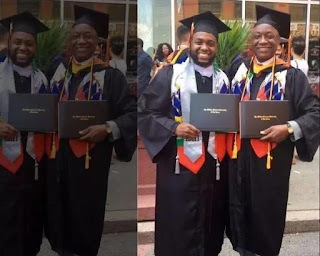 Duvinson Jeanty graduated with a degree in finance while his son Ben earned a degree in psychology – both from William Paterson University – on Friday, May 19. Their achievement was even more significant because they are the first members of their family to get college degrees. Duvinson is a Haitian immigrant who first arrived in the US in the mid-1980s and worked as a bus driver for 27 years before retiring in 2015. Ben said his father’s hard work always set an example to the rest of his family. He added that he followed his father’s advice to study despite having a well-paying job. Duvinson said he is planning to study further to obtain a master’s degree in finance while running his real estate company.